Gutter cleaning is a preventative maintenance service that is recommended to be carried out annually to prevent blockages backing up causing overspills, flooding and subsequent expensive damage to external and internal walls, decorations, furnishings and carpets. Our Gutter Vac and wireless camera survey system reaches heights of 52ft (4-5 floors). The Gutter Vac system is a self contained unit with 4200 watt motors producing exceptional suction. It remains the safest and most cost effective clearing method with better results. 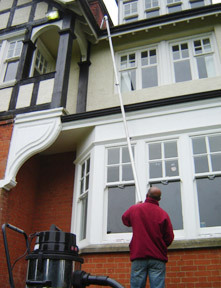 Gutter clearingExcel Cleaning Services’ professional vacuum system quickly and easily unblocks low level and high rise guttering and our unique separate jetting system attached to a power pole will make light work of any truly blocked down pipes. all work comes guaranteed. 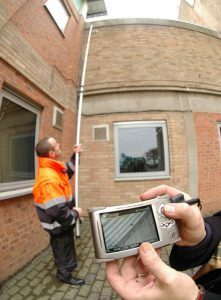 If you are not sure whether your gutters need clearing, our wireless camera survey system can inspect and if requested record to DVD a evaluation of the condition of your gutters so you can see what needs to be done. 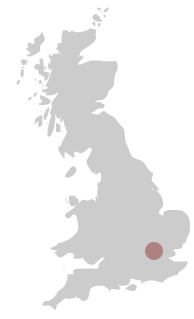 Prices for this service are based on a call out charge and a rate per hour spent thereafter. Why not have your fascia and soffits cleaned at the same time?